Telepresence robots have been around now for about 5 years but the industry is entering a new era. Increased sophistication in mobile and BYOD technologies are bringing the prices of these devices down. Consumers are starting to see more options available. And if things keep going the way they are, Telepresence may well prove to become the innovative channel by which robots finally go mainstream. Let’s pick up the discussion where we left off with a review of some of the up and coming trendsetters that we’re seeing in this disruptive marketplace. In the last segment we mentioned Suitable Technologies BeamPro version as a robust enterprise Telepresence solution. In response to the decrease in the market, the company is getting ready to release a more versatile, cheaper version called the Beam+ at $1995. This will be shipping in time for the holiday 2014 shopping season. Unlike its counterpart that is more suitable for office and professional settings, Beam+ is targeted to the home environment. The main differences between the two units are that Beam+ is shorter, has a 10 inch screen, has a 2 hour battery life, runs slower and is sized more appropriately to suite a household setting. Based on the success of the BeamPro, the Beam+ is sure to be a hit and at a very competitive price. China is getting into the Telepresence market in a big way with a sleek new Telepresence device called the PadBot. It’s not released yet but has completed a campaign on the crowdsourcing site, Indiegogo and is now getting ready for production. 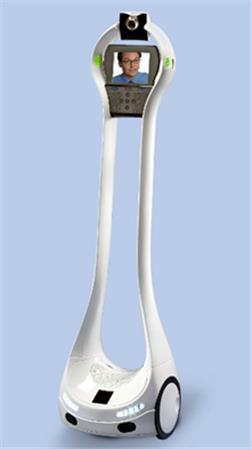 The design is sleek and cool and has been compared to a “white goose.” Like Double Robotics, PadBot supports an iPad for the head mount. It also offers anti-collision and anti-falling systems. The PadBot is targeted for home and office or anywhere that makes communication easier and more versatile. But here’s the real kicker: PadBot was marketed for $349 per unit! Even if it’s commercial release goes up to $500, PadBot represents a significant shift in the market towards much cheaper and more accessible Telepresence devices. 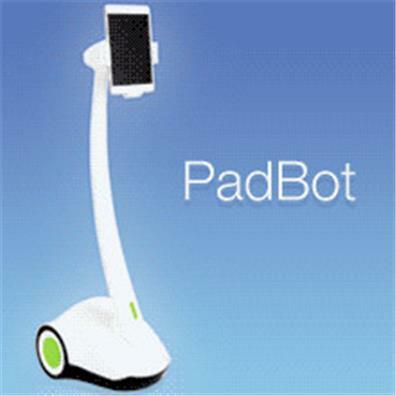 If PadBot is aiming to become the iPhone of Telepresence devices then it’s off to a great start. Fellow Robots is another up and coming player in the Telepresence market, which is focusing on the area of what they call “retail robotics.” The initiative is an offshoot of a number of technologies from Singularity University and claims to be the first company that provides service robots for retail stores. The robots are intended to provide automated assistance to customers needing shopping assistance in physical stores, whether that involves help in locating products or just monitoring customer behaviors and requests. There are not a lot of details about the production and release of this device, but a video here shows that company has received $200,000 of investment so far and is offering a price point of $1500 for each unit. While Fellow Robots is not targeted for the office, it is an exciting development nevertheless in showing how the Telepresence is rapidly seeking new use cases and markets. One of the most popular and versatile Telepresence devices on the market is VGo. The robot started selling in 2010 and has made significant inroads into a number of industries, including medicine and education. The VGo all in one Telepresence device is 4 feet tall, offers a battery life of 6 hours between charges, and connects to the internet using WiFi or Verizon 4G LTE service. Verizon showcases VGo as a robotic Telepresence solution that provides educational solutions for children that cannot attend a traditional classroom due to illness, socio-economics, or geographical separation. VGo is a great example of a device that has gained tremendous versatility for extending Telepresence beyond the domain of the traditional office. At $5995, VGo is higher priced than some of the other solutions we’ve discussed, but the market traction it has received suggests that VGo is definitely worth the investment.